Obviously Nissan is producing the right kind of Leafs. Charging a Nissan LEAF in London has become simpler and cheaper with the launch of the Source London charging network. To mark the start of the initiative, Nissan is providing LEAF owners across the capital with access to the charging points for free. 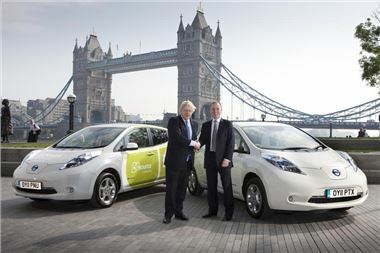 In support of the scheme, launched today by Mayor Boris Johnson, Nissan will give all LEAF owners who live within 40 miles of a Source London branded charging point 12 months free subscription when they buy the 100% electric vehicle before the end of the year. This is in addition to existing savings as LEAF owners do not pay any road tax or the London congestion charge. The Source London scheme provides a city-wide network of public charging points across the capital. A network of over 1,300 charging points will be installed by the end of 2013 in residential streets, supermarket and public car parks, shopping and leisure centres. Members of the scheme, which normally costs £100 to join, will need just one card to access all the charging points regardless of which borough in London they live. The Mayor of London, Boris Johnson, said: “I want to rapidly accelerate the uptake of electric vehicles and make London the epicentre of electric driving in Europe. Increasing numbers of motorists are opting for cleaner, greener electric transport, delivering a host of benefits to the driver including a 100 per cent congestion charge discount. This is set to deliver considerable environmental benefits to our city. The Nissan LEAF, which went on sale in the UK in March, has a range between charges of up to 110 miles, as tested over the New European Driving Cycle (NEDC). It comes fully equipped with features such as climate control, satellite navigation, rear-view parking camera, a quick charge socket and innovative smart-phone connectivity. Nissan LEAF's advanced on-board IT and telematics systems provides continuous information feedback to the driver, including battery capacity and range, and provides the location of the nearest charging station. Navigation information is continuously updated giving drivers the latest accurate traffic conditions en route.